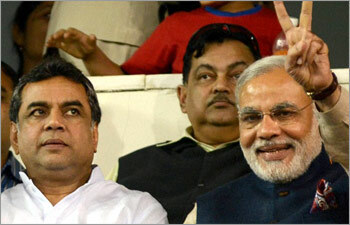 Paresh Rawal, 63, the illustrious actor may play Narendra Modi on big screen, if things go as planned. After Bhaag Milkha Bhaag biopic seems to be the flavour of the season in Bollywood, whether it’s Priyanka Chopra playing Mary Kom or Ranbir Kapoor getting into the shoes of Kishore Kumar. Clearly following suit is US based NRI filmmaker Mitesh Patel who is bowled over by Gujarat Chief Minister Narendra Modi. Currently in Gujarat to finalise the locations he says “after Sardar Patel, Modi is probably the only Gujarati who has the similar qualities of being a leader.” The Vadodara-born filmmaker is trying to cash on Modi’s popularity and film’s release may further help Modi reach out to a larger audience. Apparently when Patel went to seek permission from the CM, he gave a simple reply saying “okay” for the project. And the first obvious choice for the role was Paresh Rawal who played Sardar Vallabhbhai Patel in ‘Sardar’, a 1993 biopic on the Iron Man of India. During the last election campaign Rawal was seen giving speech in support of Modi and also calls the CM a true ‘visionary’. On the similarities of the two leaders (Sardar Patel and Modi), Rawal says “both are straightforward, blunt in nature and visionaries. They are sons of their soil, robust yet simple”. He believes playing Modi will be a defining moment for him as an actor, like it would be for the country, if Modi leads it. The film’s director and cast are yet to be locked. However, writer Mihir Bhuta, and Kishore Makwana, who penned a book titled “Samaajik Samrasta” based on Modi’s speeches and writings, are helping to put the film together. Mitesh Patel’s Rs.50-crore movie, which is likely to hit theatres in 2014, is being planned as a biopic tracking Modi’s life from the time he used to serve tea at bus stops in Gujarat to becoming the most talked about political leaders of the current times.